"This is so exciting! 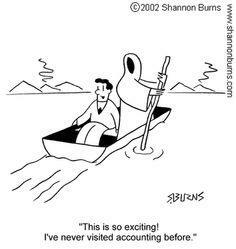 I've never visited accounting before." "That's the problem I make a mistake and then spend three hours trying to find it." 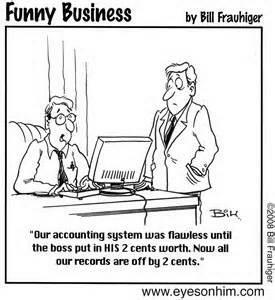 "Our accounting system was flawless until the boss put HIS 2 cents worth. Now all our records are off by 2 cents." 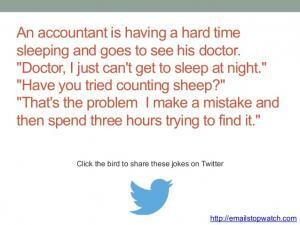 How does a CPA say the F-word? "Yes, I had to sell the jeep to pay the bill." 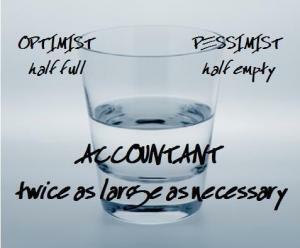 The accountant enjoyed the job, figuratively speaking. What would Economics be without assumptions?